One of the most important things a business can do to increase the profitability and success is to ensure that business is running as efficiently as possible. By creating a space which is conducive, productive, and efficient for workers business operations run smoothly. A well-designed corporate interior plays an important role in keeping your company visible within the industry and making your brand distinctive. Corporate interior designs should be welcoming and look professional to make pleasant and functional to work in, and professional and welcoming to non-employees. A well-designed office creates a healthy workplace and has the ability to enhance and support the success of a business. When your office space is poorly designed it can be detrimental to your business. But with the right interior design, employees are more motivated and inspired to work in a space when it is brighter and welcoming. This leads to increased customer service and customer satisfaction. Additionally, an inviting atmosphere is a great way to showcase success, branding and professionalism. Successful businesses invest time, money and energy to ensure their offices are well-designed. Corporate interiors in Boston, MA are a practical investment because they help create your company’s identity and a healthy workplace for workers. Therefore, a well-designed interior can make a positive impression for the company and can put the business in the best light. To find out more about corporate interior design options, contact The Exhibit Source. Employee engagement is necessary for increasing productivity in any company. Employees who are actively participating in company activities manifest a clear commitment and dedication to work. While the work space is often overlooked, it can also be regarded as imperative to creating an efficient and creative place to work which can often reflect the kind of performance expected by the workforce..
Company work environments that promote employee engagement often require visual appeal to ensure that the message gets across. Eye catching corporate interiors used in displays, bulletin boards, wall decor and information corners definitely elicit interest from workers. Greater enthusiasm among workers is geared towards active participation and professional engagement. Professionally appointed corporate interiors in Boston, MA address these corporate needs through state-of-the-art design and top of the line materials. Corporate interior design can play a huge role in company operations and success. First rate business interiors are strategic, not only in promoting collaboration among employees but in projecting a welcoming environment to clients as well. To find out more about corporate interior design options, contact The Exhibit Source. If you are looking for a trade show display that has great visual impact, is lightweight and easy to deploy, cost-effective, and freestanding, then 3D banner stands might be a great choice. This display meets all of the above criteria and can be your ultimate marketing tool at trade shows, conventions, and other marketing events. This is very popular because of the stunning graphic prints and unique designs which are eye-catching. Its contour fabric creates an intricate three-dimensional design that’s hard to miss on the show floor. 3D banner stands in Boston, MA can add a modern touch of elegance to your display without breaking the bank. They are lightweight and easy to assemble. Also, they are portable which makes it a perfect choice for traveling when you have another trade shows to attend in different places and at different times. With a variety of sizes, designs and economical prices available, looking good has never been so affordable. 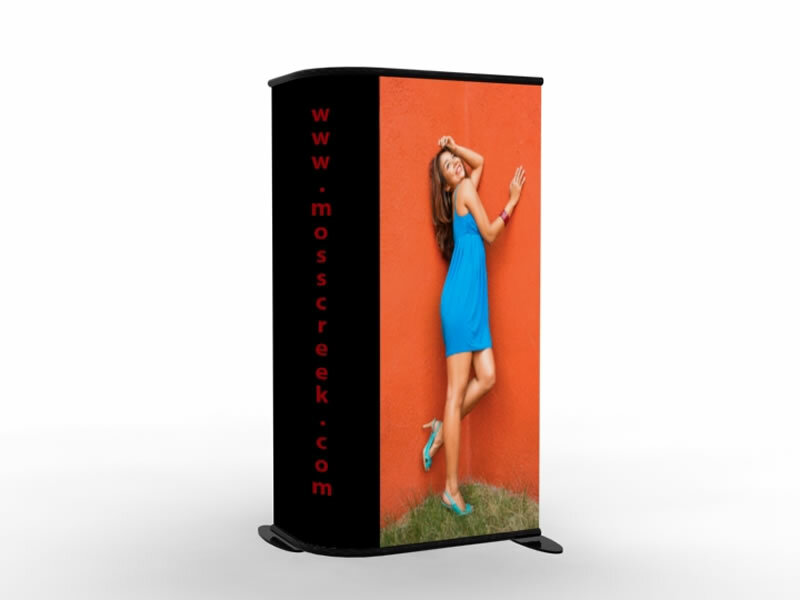 One of the great advantages of 3D banner stands is that they are customizable. Professionally designed 3D banners can spark the interest of the audiences in the trade show floor that is why graphic and structural exhibit design plays a major part in highlighting your specific message. Unique customized 3D banners are excellent for capturing attention at a trade show or any marketing event so keep your banner design minimal, with clean lines, and make sure your brand and company name stands out. To find out more about 3D banner stands to own or rent, contact The Exhibit Source. Corporate interiors make an office set-up look a lot more professional and sophisticated. It also provide a conducive environment for workers, inspiring them to become more active and productive in their work. A well-designed office interior also present a better, more successful first impression for your clients and staff. Corporate interior designs should be tailored to the company's specific purpose and goals. Interior designers should take onto account the daily business routine in order to create a functional space that can aid them in reaching their sales goals. It is understanding the aspects of the current workplace set-up that requires more emphasis and improvement to become more functional and effective. Corporate interiors in Newton, MA should not only focus on the beauty of the physical arrangement of your office but it must also create an environment that promotes a sense of collaboration between employees. To find out more about designing an effective corporate interiors, contact The Exhibit Source.